Are you a user or integrator? The course is questioning the very heart of what I do. That’s a good thing, right? Being a humble Art teacher, I know that we have limited time each week to get the content of our course across. For Middle School students this is approximately 75 minutes per week amounting to to approximately 45 hours over the 36 weeks of the school year. Sounds like a lot? Take out a lesson here and there for Day of Sports (3) Science trips, Outdoor Education trips and so on and we usually end up with about 30 lessons we can guarantee planning work for. We have a well planned curriculum developed collaboratively over the last 4 years. Our model develops the students skills in the disciplines of Drawing, Painting, Sculpture, Photography and Printmaking all relevant to the iGCSE Art courses we provide at UWCSEA. We find it near impossible each year to cover all these disciplines and are working currently to spread them over the 3 year programme. Further up the department and into iGCSE and IB the use of Technology in Art disappears almost completely apart from in Photography. I have always been intrigued by Technology yet found few Art teachers integrating it authentically into their curriculum. More often it is seen as an add-on or an opportunity to try something new but rarely redefining. This bothers me. We have so little time to squeeze in all the wonderful work we want to cover, so how on earth do we integrate technology meaningfully, effectively and authentically? It appears that most Art teachers take one route or the other: wholly traditional with a splattering of technology once in a while or predominantly technology (digital art) with a little traditional on the side. Why is it so hard for it to be both? Integration suggests that technology drives the curriculum (see this wiki) and it is with this incentive that I start to reanalyse where I am at. In scrolling the readings and looking for inspiration online, I stumbled on a comparison grid on teachthought where using technology is compared to integrating technology. 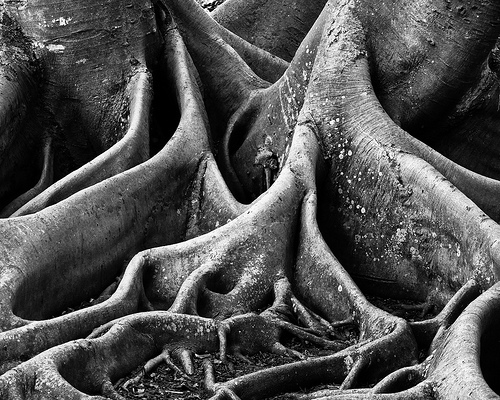 It helps to ground my thinking and encourages me to look deeper into my own practice. The SAMR model shows us that substitution only serves to enhance the content rather than transform and redefine it and that collaborating should be at the heart of it. In the video SAMR in 120 seconds, google docs are a clear example of this and, at UWCSEA they are a common part of our lessons now. 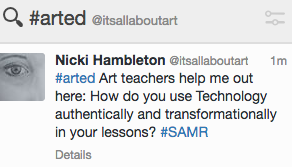 Applying the principle of SAMR to the Art classroom, in ways other than google docs however, takes some thought. Earlier this year during a Grade 6 unit on drawing students were trying to comprehend the use of line to define shape and depth. 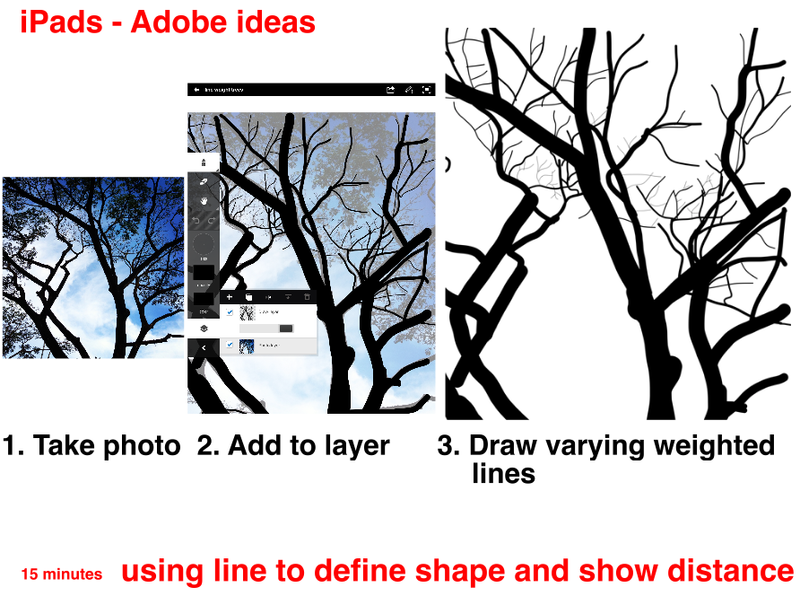 As they struggled to see the reason for using a variety of line, I decided to try out Adobe Ideas with them in capturing trees. We took the iPads outside and photographed the branches of the trees in the distance or looking up to the sky. After a short explanation of the simple tools in the programme the students focussed on the task: to vary their use of line whilst capturing the tree itself. Sounds simple right? The beauty of the app was that the line variation would capture the qualities of the tree as well as emphasising depth and distance. The task reinforced the students learning of the concept through this task. Whilst this was no revolutionary task it served to help the students to understand the concept. Is this substitution or augmentation? How do I redefine this or any other task so that it is inconceivable without technology yet still teach students the basic traditional skills they need in Art? So how do I move further up the ladder? A conversation with my IB Physics husband about his understanding of SAMR in his classroom developed into an example of using the iPhone’s feature slo-mo to capture a ball bouncing. He explained that being able to show this to his students in this clearly visual and practical manner could not have been done without the use of current technology and that it would have been difficult to show in any other way. The iPhone made it achievable and quickly shown in class saving valuable time. As I look inward to my own practice I think about my current Grade 8s as they begin a unit on Digital Storytelling through photography to develop skills in composition in preparation for iGCSE. They discuss what they see, think and wonder about an unseen photograph to decipher the story behind the image, watch the video (The World’s most Powerful Photographs) and the video by One Direction “Story of my Life”. For homework they are locating a photo of them from many years ago and recreating it now then posting it on Voicethread or Picasa to share with their peers. Here they can reflect and comment on each others compositions and the story that is being told as a opening discussion to the unit. But could we have just shared the print outs and written the comments on post-its? Did their use of online posting transform the task, would they have produced as good a result without technology? Am I being hard on myself or is my instinct right? The methods are transforming the way that they learn but not transformational. UWCSEA students have laptops every lesson and sharing their work online is now routine. They frequently use google docs to share thoughts and ideas collaboratively and when planning in groups this method is natural. But to grab an iPad and use an app spontaneously in the middle of a painting or sculpture unit seems rather alien. It takes time for practice to change and students instinctively know what works and when technology is appropriate. Just last week a Grade 10 student was researching artists for her mock exam theme “Food for Thought” and could not find enough contextual information on her. So she visited the website and emailed the artist who, in return answered her questions which took her forward in her planning and idea formation. All in the space of a few hours in the comfort of her home. This would have been inconceivable without the use of technology. Imagine 15+ years ago when looking at an image in a book or magazine was the only way to connect to other artists. Nevertheless this is not a very inspirational a use for technology. So what is? How complex would it be to integrate Skype in the Classroom regularly and how crucial to the Art curriculum is Augmented reality or QR codes for example? Granted they transform the viewer’s perception or involvement in the art itself but is it transformational and indeed imperative or are we including it as a fad or a cool idea? Looking at the top bar in the above graphic helps me to see where I may be getting it right. Occasionally students will use the iPad app Explain Everything (or Educreations) to reflect on their work, explaining and annotating what they would do to take their work further or to improve it. Often I would feedback to students in a similar way and, using Google docs we can have a 2 way conversation about their art quickly and effectively. 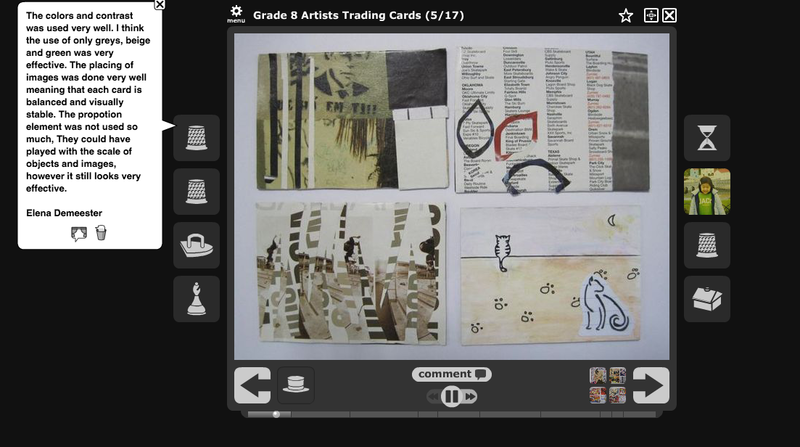 When I first started using Voicethread years ago, some of the clunkiness frustrated me, but when it worked it was faultless in transforming the way students interacted with each others art. Being public they discussed more in depth and perhaps, knowing their work would be online and discussed helped them to work harder to produce higher quality work. 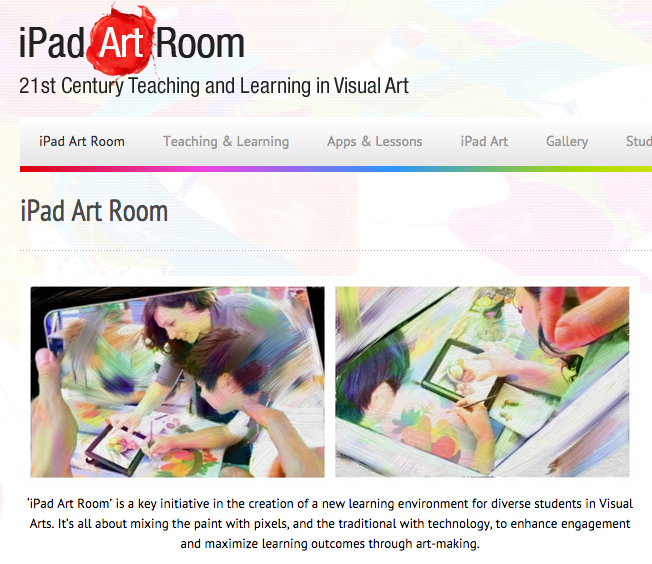 The fundamental question I have though is: What technology really transforms art education? 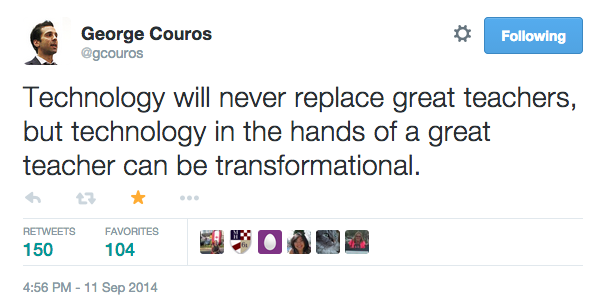 What if we truly acted like technology was just part of us, part of education, part of educating students today. What if we start embedding it and stopped integrating it? It is only when we root our thinking in technology that we will be able to redefine our teaching. My thinking is that I don’t want to take out valuable traditional skills but to enhance them with todays. Students struggle to share their work and to receive good feedback so digital portfolios seem to be an effective way for me to embed technology into my curriculum. My students used to blog their learning and seemed to enjoy this process of sharing and connecting online. Using iBooks Author, students may well be able to share and demonstrate their learning more authentically with videos, audio, images, demonstrations as well as photographs and words. Would this be a good use of moving up the SAMR ladder? I don’t want to be the same or even different, I just want to ensure that technology has its rightful place within my curriculum and that it transforms the way Art is learnt and taught. Is that too much to ask? Comments and feedback encouraged and gratefully received. Update: Following conversations about the cyclical nature of SAMR I am reworking the above seed to tree illustration. Watch this space! NIcki, once again great work. I love watching your thinking on the iPad and it gives me some more ideas of what to do their apps. I’m also passing along your ideas to art teachers here. I think, though, I would disagree with the Redefinition component of your visual. Isn’t SAMR more about developmental, if not evolutionary change, rather than growth? Perhaps, as educators, we are attempting to grow at an exponential rate to the point of redefinition as though the R is almost not related to the original substitution. I see it as transformative; becoming a Jedi, attaining Nirvana, morphing into a new shape, or a plant that becomes hydroponic with larger leaves to capture more sunlight. Or even a superhero recognizing the superpowers within. Here is a negative metaphor but Anakin changing his physical makeup, as well as his slow fade to the Dark Side, into Darth Vader. 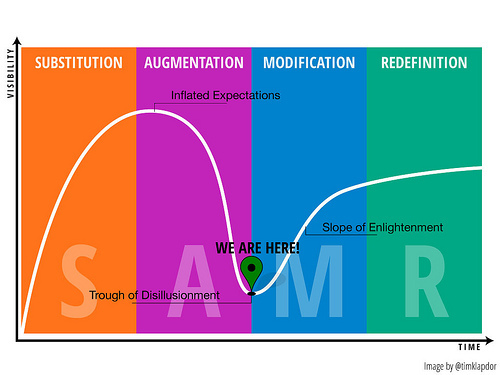 If we look at SAMR as growth, then perhaps we aren’t doing enough to redefine. Or alter….evolutionarily. Just a thought that became a stream. Thanks for your comments and suggestions. I um-d and er-d for ages about the design looking to Twitter for suggestions as it was difficult to find an analogy regarding transformation. Most images or diagrams for SAMR are simple boxes or a ladder (again not transformational) and I didn’t want to repeat the ladder style. I thought of an Evolution style sequence or the stages in a butterfly but adaptation is a good way to look at it. How might I rework the plant one? We had a great Twitter discussion on SAMR being more cyclical than linear last night between 4 of us and my thoughts ventured to a circular design maybe seed to plant to tree, apple, replant and so on but I am not sure the adapting/transforming is still covered. I HAD to put my post up last night as I was already days late with it and I nearly put it up without the design! Maybe I should have! Thanks for your time and ideas and any further suggestions gratefully received! I think a lot about these things. Some things are very valuable and we can’t really transform them without a solid ground on the basics. I think (from my limited experience) art is like this. You need to be able to use the paint in different ways, the iPad won’t do the same thing. So, I think you are on a good plan to develop reflection and publishing opportunities for your students. I remember last year you were talking about having students post to a site and have other art classes comment on these pieces of art. I think that this (the first time you do it anyway) is redefining how art is learned. By connecting students with other students (outside of class and “learning time” in the classroom) they have their peers thinking about how to create, adapt, remix and promote their work. This peer to peer connection is very powerful. I love the picture of the plants and have been thinking since last night about what the seeds from the redefinition plant will bring forth. Thanks Joe, as ever you are able to see where I am coming from and understand my dilemmas!I set a reflection task just the other day, where students could choose the format they submitted – the discussion was fabulous to hear just how far they had evolved from writing it on paper to using screencasting or annotation apps to fully integrate image, text and voice. We shall see how the actual work comes out but I have high hopes for the quality of them. On the publishing note, my students blogged last year which worked well with Google reader as I could add blog lists onto the website for ease of sharing but now without that functionality I can’t see an easy way for them and other students to connect. Any suggestions? We use Picasa sometimes too, but it is usually inhouse, as is Voicethread. The SAMR image is still stressing me as it has been pointed out on Twitter but I am struggling to find the time to get it right -they take quite a while to draw from scratch as I am a bit of a perfectionist. It’s on my list but so is this week’s one on gamification! I’ll keep thinking about ways to connect on your blogs. I do think it’s a very powerful tool and your work on it last year impressed me for sure. 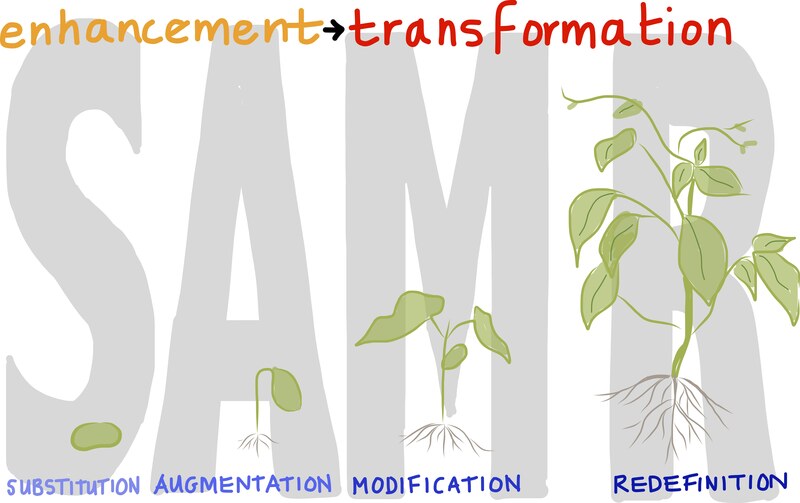 Didn’t mean to stress you out with the SAMR image, I think it’s great, I was thinking (in my own mind) about the next steps, and then how you could link that to Jaime’s transformative process because a new seed does transform into something else (maybe?). Anyway, just thoughts, not a call to action. Thanks again for the Cognitive Coaching nudge, really looking forward to getting into it. 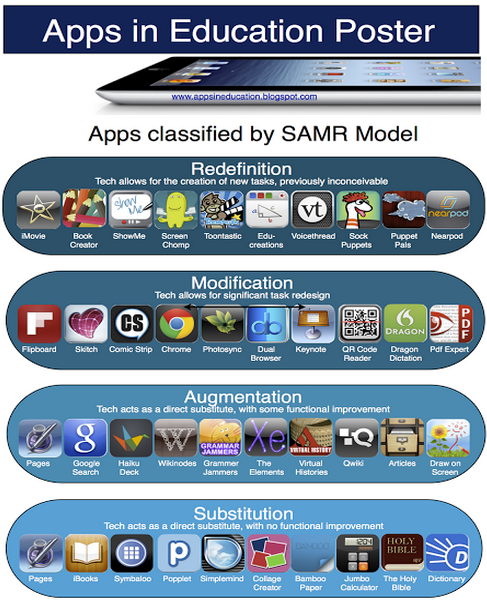 I was just involved in a conversation during EDULAN in Seoul about this SAMR topic. We discussed how the model might be great framework to analyze when curriculum planning and decide which projects needed to be redefined, which ones would work best with modification, substitution and augmentation. I am thinking that each of the four parts of SAMR are more like choices that you have depending on the amount of time and how many changes you have already made to the project. For example, if you redefine a project this year, do you really need to redefine it again the next year. Although, you might need to substitute some of the tools you used because you have found better ones. That is a good point and one that resonates with me. We don’t have to keep changing every time we find something that works and then search for the next best thing. Being aware of what is out there and how it would redefine a task for the better is the challenge. I like the idea of choices too and that you may be higher up in one aspect yet not in another part of a unit or skill set. Still lots to think about! Thanks for taking the time to read and comment, I really appreciate it! The Power of Visuals – how are you going to use them?